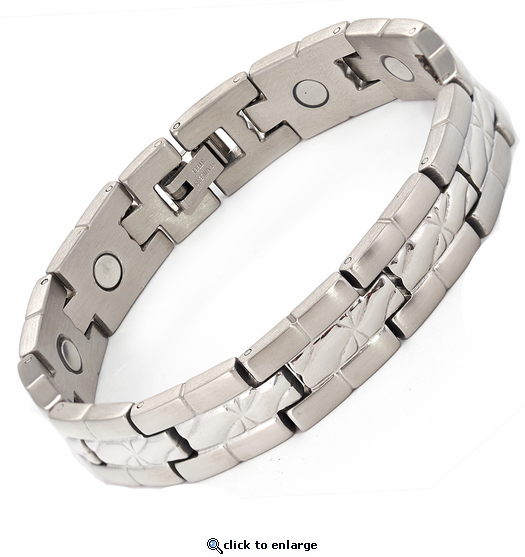 This is a solid silver stainless steel magnetic bracelet. It has brushed silver edges with a textured shiny silver center. This magnet bracelet is very substantial at about 1/2" wide, and has a powerful & permanent 3300 gauss neodymium rare earth north facing magnet in each link. Very satisfied with the bracelet I ordered. Great quality. Package and delivery great. I've been wearing the bracelet for a little over a week. Whether imagination or reality, the fact is my back and hip do not hurt nearly as much. I have referred several of my friends to your site. I had worn a magnetic bracelet for over 10 years but lost it. Within a few weeks of not wearing a magnetic bracelet, I could feel the aches and pains coming back. So I decided to buy another bracelet. I love the look of the bracelet, so stylish. It really helps. Very pleased with the product and service and have recommended your website to friends. Your product has the stronger magnets which alleviates my wrist and joint aches. I like the bracelet very much and it wears well,Thank you.Patrick. Very excellent customer service. There was a problem with my bracelet and the company was quick and very generous to replace it. Would definitely recommend this company for their prompt response and resolutions to satisfy their customers. GREAT CUSTOMER SERVICE!!!!! I ordered two of your stainless steel bracelets, one for each wrist as I have a lot of pain and swelling of both wrists from years of typing, using computer, crafting and as a dog groomer. I wore them for about a month and noticed less swelling and pain. I then took them off for a week and the swelling and pain returned. I put them back on and within a week my pain and swelling has been reduced. I was to have hand surgery this winter but after my appointment with my hand surgeon, he says that he can see significant less swelling and suggests I continue wearing the bracelets as they have improved the pain and swelling. What I like about your stainless steel ones is that there is a magnet in each link and I don't have to remove them to take a shower so leave them on 24-7. I wear other decorative bracelets and feel they go well with any style. Customer Service and ease in shipping is the best! Thank you! About six weeks ago, two magnetic bracelets were ordered due to extreme arthritis pain in both wrists and hands causing me limited hand usage. After wearing the bracelets daily, the hand usage in both hands has returned and the pain has lessened to a very tolerable state. Although the pain is not 100% gone, I can now function in a normal manner. The bracelets fit as advertised. Because of my success , my doctor has requested the computer site for the Magnet Jewelry Store in order to pass it along to other patients that may be helped with magnetic jewelry. Medically and scientifically I have found nothing that says magnets will work in the manner that has helped me. But it has helped me and I encourage others to try magnetic therapy to see if it might help them. Very satisfied with bracelet. Received promptly and fit perfect. Bracelet is exactly as described on the web site. this was purchased and given to a coworker as a birthday present, she love it, she said her wrist feels much better and that she will be shopping your site for Christmas. I bought this bracelet for my husband and so far he likes it. We have tried other magnetic products but he wouldn't wear them. He has taken this one off since he got it. I purchased 2 for my husband. For both of his wrists. Doctor told my husband he had caral tunnel in his wrists and to wear braces at night, which did not help at all. My husband put these magnetic bracelets on and has never taken them off. After just the 1st night my husband found much relief. Within a week he barely has any problems at all now and does not need surgery!!! Quick delivery as always! And the bracelets look very expensive and no one knows they are magnetic bracelets. My husband says they are very comfortable to wear - does not even notice he has them on. And they have not tarnished or anything even though he wears them 100% of the time, showering, etc. LOVE LOVE LOVE these bracelet! Well, worth the money!!! And I have purchase over a dozen times from this company and highly recommend using them!!! Great customer service, too!!! So far so good Seems to stop the pain in my thumb..
the clamp on my braclett is not tight. I have found it on the ground twice now. It just falls open. It really helps the pain in my hands. I have bought 2 in one month. Not happy with clamp.Reply by MJS: Is the bracelet too large? It can sometimes be more prone to happen if not the right size. We are glad to re-size for you if needed, or we are glad to repair or replace. I like this product. The price is good and also the quality is very good. 5 Stars !!!! Looks great/ feels great. Though this bracelet is a bargain, it looks and feels like I bought it at a designer store. Can't complain at all with the quality & price of this bracelet! Real happy with purchase! This product hit every mark! Being stainless steel-no plating to come off. Low prices and shipping included. What else could you want? Awesome, I'm glad I ordered it. This is a very nice product, great workmanship and perfect fit. I gave had many complements on my bracelet and inquiries as to where I got it from. I have referred them to your web site. Thanks. Bracelet scratches easily from normal day to day wear. Impressive Service, good quality for the price. Pain was gone within 2 days. I couldn't rate this vendor any higher. The price, product quality, swiftness of shipping were outstanding. Would recomend these people to anyone shopping for any of their products.